Complete home comfort is about more than just temperature—it’s also about maintaining a healthy home with indoor air quality. Dusty, dirty homes at any temperature can mean discomfort. The air in today’s tightly-sealed, well-insulated homes can become stale as the same indoor air is circulated and re-circulated. In fact, indoor air quality is among the Environmental Protection Agency’s top 3 health concerns. The agency reports that with dust, pollen, pet dander, mold, skin flakes, chemical fumes, cigarette smoke, Radon gas and more, the air inside your home can be 2-5 times dirtier than the air outside. Although we usually can’t see them, air pollutants are all around us, already inside our homes, and waiting to come in from outside. From our yards to our kitchens, dangerous air pollutants threaten our home health and air quality. Plus, each season brings its own dangers, from mold in the fall and winter to pollens and high humidity in the spring and summer. Fortunately, Carrier’s wide range of air quality solutions, including humidifiers, UV lamps, media filters and air cleaners, can together eliminate many of the pollutants threatening your home’s health and improve indoor air quality. We use only the very best and most effective technologies. These are derived from million-dollar filtration installations used in cleanrooms, airports and hospitals. Unlike many of our competitors, we only use technologies, which produce absolutely no undesirable by-products, such as ozone, chemicals or charged particles. We only use air cleaning technologies, which are user friendly and low maintenance, since we recognize that popular high-maintenance technologies, such as electronic or ionic air cleaning, annoy owners and quickly become defective. 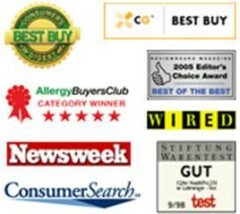 IQAir has received more #1 product reviews than any other air purifier manufacturer. We are proud and honored so many experts agree. Hospitals around the world rely on IQAir to help protect staff and patients from infectious diseases like tuberculosis and MRSA. When the dreaded disease SARS began to spread in Hong Kong hospitals in 2004, the Hong Kong Hospital Authority tested dozens of air cleaners. They determined that IQAir made the only room air cleaners suitable to be used in the fight against SARS. All IQAir air purifiers are 100% ozone-free. They are certified by the IAACM (International Association of Air Cleaner Manufacturers) to produce absolutely no ozone. Ozone is a lung irritant emitted from ionic and electronic air cleaners. Even small amounts of ozone are undesirable for allergy and asthma sufferers. In a short-lived world, where companies come and go, IQAir is proud to have stood the test of time. When Klaus Hammes and his brother Manfred introduced the world’s first residential air cleaner in 1963, they pioneered an entire industry. It is with this history in mind and the future at heart, that our family company continues to provide products that are at the cutting edge of air purification. Made only in Switzerland, IQAir products are designed to provide reliable performance for years to come. By utilizing the best Swiss and German engineers, the world’s best components, and a dedicated team of skilled craftsmen and women at our state-of-the-art Swiss factory, we are regularly able to exceed the expectations of even the most demanding customers.